More than 320 people attended the first-ever Wisconsin Leadership Summit, held Thursday, Oct. 18, through Friday, Oct. 19, at the Ho-Chunk Convention Center, Wisconsin Dells. The event was a joint venture between the Ho-Chunk Nation and the Madison-based organization Madison 365. Some of the state’s most influential leaders of color gathered to discuss issues facing communities across Wisconsin. It also offered a chance for people of similar interests to network and make new friendships. Ho-Chunk Nation President Wilfrid Cleveland offered the welcome address and the Wisconsin Dells Singers provided the opening songs. Five other Ho-Chunk members served in some capacity in breakout sessions during the Summit. 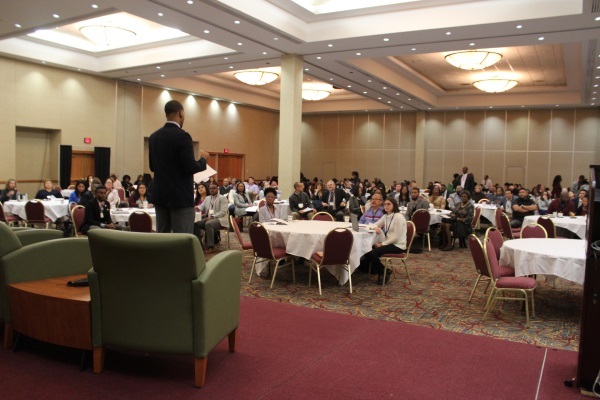 “It was an honor to participate in the summit with so many experienced leaders of color from across the state. It was a chance to talk about some important issues from our unique perspectives,” Michel said. “The panel I moderated, ‘Innovations in Post-Secondary Education,’ touched on some of the challenges that face educators and administrators in creating an inclusive environment for students of color, but also highlighted some successes that panelists have had in the area of increasing diversity at their institutions,” she said. “One of my takeaways from the panel was that if a university is serious about recruiting and retaining students of color, its leaders need to practice a culture of inclusion, implement policies and programs that promote diversity, and hire faculty and administrators who represent diverse communities,” Michel said. During the “Addressing Disparities in the Health Care System” session, healthcare panelists explained why people some people have difficulty obtaining adequate medical care. Some of the panelists cited living in areas where medical care is not nearby, while others referred to social and economic obstacles. Yet, there were more sides to the issue. Education directly relates to health, employment, and quality of life, she said. In her practice, she sees about 75 percent native patients and 25 percent non-native patients. “There are a lot of health disparities. We need to make a concerted effort to work together,” she said. The event also offered the opportunity to celebrate the arts of a variety of Wisconsin cultures with a Community Arts showcase during the dinner session on Thursday evening. The Mexican dance troupe DanzTrad, the Hmong dance group Viv Ncous, and the Ho-Chunk Wisconsin Dells Singers displayed their talents and cultural traditions. Madison 365 is the basis for a news website that posts articles pertaining to issues concerning people of color. The website has between 750,000 and 1.8 million views each month. Madison 365 CEO and Publisher Henry Sanders got the idea for the summit from Madison 365’s “Black Power 2017” with the Milwaukee Bucks to celebrate Black History Month and Madison 365’s “Sí se Puede 2017” list with the Milwaukee Brewers to celebrate Latino leaders’ accomplishments. “This was never intended to just highlight problems. If we talk about problems, we need to talk about solutions as well,” Sanders said. “This is just the beginning. We plan to hold this event annually. We need to dig deeper into conversations. In another breakout session, Brown told how his work involves connecting with the community. There has been a significant push in the community for diversity and inclusion, Brown said. “I suggested it be a ticketed event and to heavily promote it since it would be a high profile event, particularly in this social climate. He became very excited at this prospect,” Brown said. “I thought it was a very powerful statement to see these prominent leaders of their respective communities all assembled on Ho-Chunk land. With my involvement in the local communities of color, I knew a good deal of these players, and they were all very thankful and expressed an excitement of the energy flowing there that day,” he said. “I have often said when making a cold call to a leader of a community of color, ‘I don’t have any objective other than to get to know you, and for you to get to know us.’ I remind them that although our collective numbers are nearing the overall majority of the United States population, our respective communities of color still represent a minority in this country,” Brown said. “As such, all of our respective communities need to remain in contact and be at least familiar with each other if not very good friends and allies. We all share tragic histories and we still face obstacles whether subtle or overt, so we should always stick together and help each other where we can,” he said. “The Leadership Summit was a tremendous step toward more meaningful relationships with our brothers and sisters of color, especially in this current national political climate,” Brown said. Michel had similar thoughts about the event. “It was great to see the Ho-Chunk Nation hosting the first Wisconsin Leadership Summit. We have many outstanding leaders in the tribe, so it’s fitting that we should be at the forefront of this kind of gathering in our state,” she said. Sanders was grateful for the opportunity to hold the summit at the Ho-Chunk facility and to include Ho-Chunk people in the conversations.